The state constitution allows the legislature to consider the conversion of public land, so-called “Article 97 land.” This bill clarifies and regularizes the process used to evaluate such proposals. The bill’s goal is: “no net loss” of protected land. This legislation is a comprehensive climate solutions bill. It updates the state’s Global Warming Solutions Act goals to achieve net zero emissions by 2050. The bill also raises the annual Renewable Portfolio Standard (RPS) to 3%, eliminates the Solar Net Metering Cap, defines “environmental justice” and prohibits the denial of energy programs to consumers on the basis of class. It increases the required development of offshore wind to 6000MW by 2035. It requires 50% of state-owned or leased vehicles to be zero emissions by 2025. It doubles the state’s target for battery storage. It prevents a pipeline tax and it directs the state pension fund to divest from thermal coal and permits any independent retirement board to divest from fossil fuels. This bill requires that at least one of the 3 DPU commissioners have a background in renewable energy and that DPU reports annually on its progress towards achieving GWSA compliance, including towards 100% renewable energy. This bill eliminates energy efficiency incentives for fossil-fuel-fired space heating equipment beginning in 2022. Incentives for low-income residential customers would be exempt from this ban. This bill creates a commission to study the economic, energy, and environmental benefits of market transformation to accelerate beneficial electrification of space heating in the commonwealth in the decade from 2020 to 2030. This bill adds Marbled Crayfish and Marmokrebs to the aquatic invasive species list, and ensures that they are taken out of the pet trade in Massachusetts in order to protect our water systems. This bill ensures that Massachusetts will be a safe community for immigrants by protecting due process rights for all residents of the Commonwealth. 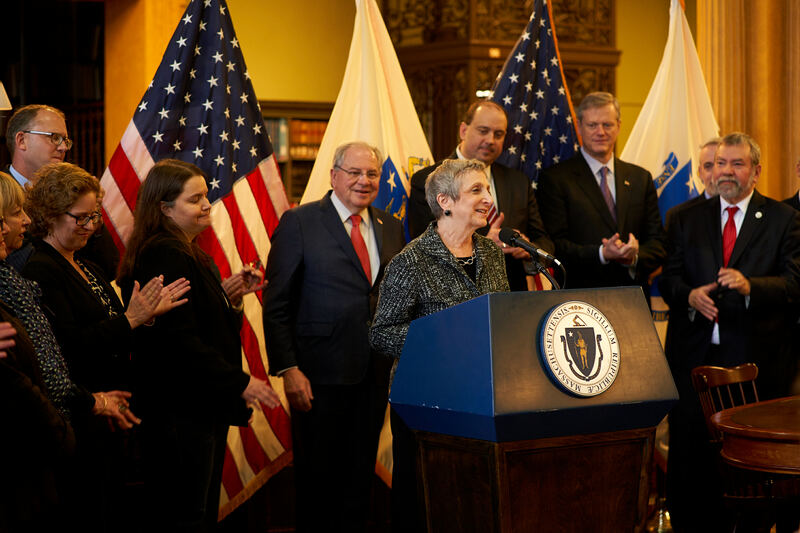 This bill establishes a special commission to rename the Yawkey Commuter rail station to a name that better reflects the Commonwealth’s values of equal rights and social justice. This bill adds reporting requirements for the DOC regarding the use of solitary confinement for LGBTQI prisoners and adds 2 appointments by the Attorney General to the committee overseeing the use of solitary confinement on LGBTQI prisoners. This bill ensures that all federal parity laws are implemented in Massachusetts. This bill would require that disability policies provide the same benefits for behavioral health disorders as other medical disorders. This bill requires the development of standards for prohibiting or limiting the use of suspension and expulsion in preschools. This bill requires social-emotional learning to be included in teacher training. The bill requires commercial insurance companies to pay for behavioral health emergency services provided by Emergency Services Providers (ESPs), just as Mass Health does. The bill requires that a health plan pay for the continuation of mental health treatment with a provider in the instance the health plan changes and the provider is no longer on the provider network, so long as the provider agrees to the terms of the plan. This bill ensures that MassHealth covers services provided by licensed psychologists. This legislation authorizes nurses to fill orders issued by psychologists. This legislation would ensure that individuals receiving psychiatric evaluation or treatment, and in transit to or confined to inpatient hospital facilities, continue to receive treatment if they engage in an act of aggression towards staff. While these individuals could still be charged with assault or assault and battery, they would not be subject to additional penalties. The bill requires that the Division of Medical Assistance and its third party contractors, such as the Managed Care Organizations and the Mass. Behavioral Health Partnership, adjust the rates for all network hospitals not less than the Medical CPI. This bill requires that the Executive Office of Health and Human Services ensure that hospitals who treat patients who also are clients of State Agencies be reimbursed their full negotiated rate when these clients are unable to be discharged because there is nowhere for them to go. This bill ensures that those on probation receive treatment rather than incarceration in the event of a relapse. This bill requires county and state correctional facilities to provide substance abuse services to any inmate with a substance abuse problem who requests it. The bill places the responsibility for the oversight of Bridgewater State Hospital with the Department of Mental Health, rather than the Department of Corrections. This bill ensures that the Department of Mental Health has oversight of the mental health services in state correctional facilities. This bill ensures that MEMA and DPH provide relevant information and take necessary preparatory steps in the event of an emergency at a nuclear power plant, taking into account the lessons learned from the Fukushima disaster. The bill expands the planning zone for an emergency evacuation from 10 to 20 miles around nuclear power stations, places mobile radiological monitoring units in that zone, distributes thyroid-protecting potassium iodide pills, and distributes evacuation and safety brochures. This bill clarifies the standard for requiring the installation of automatic sprinkler systems in rehabilitated buildings. This legislation allows any city or town, by local option adoption, to require the installation of automatic sprinkler systems in new construction of 1- and 2-family homes. This bill would remove the 25 person threshold for requiring employee training to respond to choking in restaurants and instead require that restaurants of any size have the safety requirement. Additionally, the bill removes outmoded methods for responding to choking and requires the DPH to adopt regulations identifying the approved methods. Health departments are required to inform restaurants of their responsibilities under the law. This bill establishes a commission to study the public health impacts of added salts and sugars in food. This bill includes technical amendments to clarify that there are no barriers to state agencies agreeing to share their patient safety data with the Betsy Lehman Center, and vice versa. This bill ensures that the Commonwealth Care Trust Fund continues to have sufficient revenue to keep ConnectorCare premiums and copays affordable, makes the inflows and outflows of the Commonwealth Care Trust Fund more transparent, re-institutes premium and copay protections for the lowest-income ConnectorCare members, and ensures that there is a choice of ConnectorCare plans in each area of the state. This bill ensures that stores that have lost their Kosher certification put up appropriate signage indicating the current status. This bill legalizes common law marriage in Massachusetts.